[SatNews] Inmarsat (LSE:ISAT.L) and Gilat Satellite Networks Ltd. (NASDAQ, TASE: GILT), have announced that, in selected regions, fixed VSAT operators can now access a new wholesale, fully-managed, high-speed satellite broadband service, delivered over Inmarsat’s Global Xpress (GX) Ka-band network in partnership with Gilat Satellite Networks. Inmarsat and Gilat Satellite Networks Ltd. are offering a fully-managed service designed for Internet Service Providers (ISPs), telcos, network operators and other organisations that want to use the power of GX. By leasing bandwidth, VSAT operators can take advantage of a low cost-per-bit data rate, coupled with low-cost, high-throughput terminals from Gilat Satellite Networks. 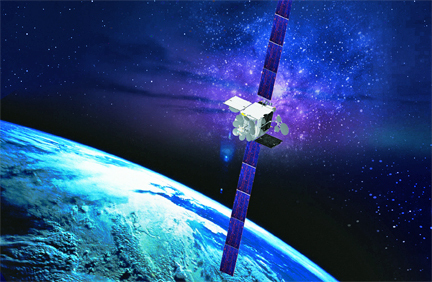 Artistic rendition of an Inmarsat GX satellite. The service is made possible through Inmarsat’s new high-speed Ka-band network, Global Xpress. The first of three satellites underpinning the GX network is already live, providing service throughout Europe, Russia, Africa, Middle East and much of Asia. The second satellite was successfully launched in February 2015, and the third satellite has safely arrived in Kazakhstan in anticipation of its forthcoming launch.